The 4R Nutrient Stewardship Certification Program has announced that the Central Ohio Farmers Co-op Monnett facility has been added to its growing list of nutrient service providers to achieve certified status. The voluntary certification program, now in its third year, is a concentrated effort by the agriculture industry to significantly reduce and prevent applied nutrients from running off fields, which has contributed to water quality issues in Lake Erie. The Central Ohio Farmers Co-op operation in Monnett is a full-service agronomy location. The facility provides a wide range of products, including grid soil sampling, variable rate custom application, liquid lime application and a recently expanded anhydrous ammonia system. The facility currently employs 18 full-time employees and three seasonal employees. Approximately 2.8 million acres and more than 5,500 grower customers are serviced by the 37 facilities in Ohio, Michigan and Indiana that have earned 4R Nutrient Stewardship Certification. “By participating in the 4R Nutrient Stewardship Certification Program, Central Ohio Farmers Co-op has proven their ongoing commitment to the long-term improvement of Lake Erie’s water quality,” said Carrie-Vollmer Sanders, Nutrient Stewardship Council chairwoman. 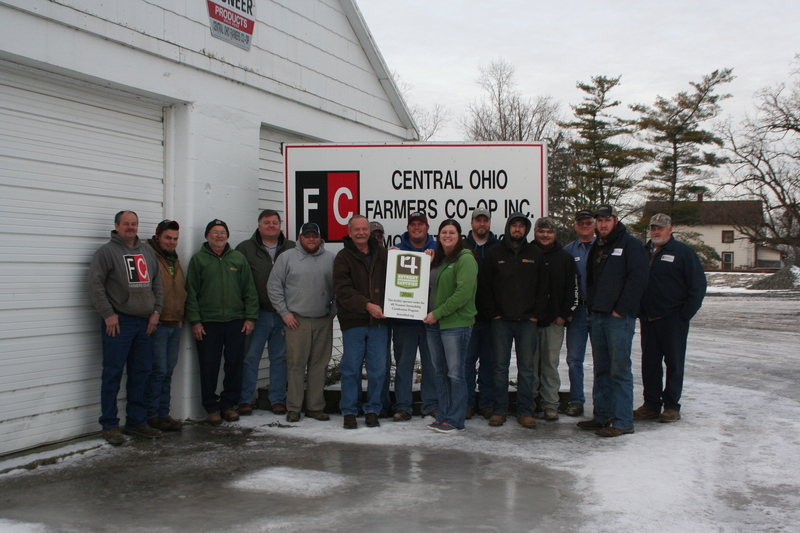 “Central Ohio Farmers Co-op has worked very hard to ensure its operation is following the 4Rs, and we congratulate them on earning certification,” said Andrew Allman, executive director of the Nutrient Stewardship Council. CUTLINES: Central Ohio Farmers Co-op Monnett facility is now 4R Nutrient Stewardship Certified. Employees pictures (from L to R) include: Ken Kocher, Chad Blanton, Jim Wert, Robert Lovett, Josh Rhodes, Gregg Burris, Ed Pitt, Cody Edwards, Courtney Benich, Mike Garrett, Travis Swerlein, Jon Cooper, Carnell Bailey, Nate Sherman and Gary Hamman.